A friend and I have recently started walking an additional 12-15 miles a week up and down the many hills in my neighborhood in Durham, North Carolina. Coupled with eating out half as much, it not only feels great but researchers note it should be expanding my hippocampus. 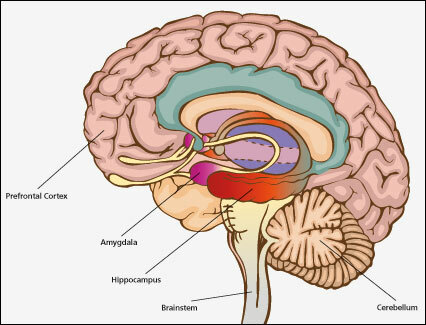 This is the part of the brain thought to be the central processing area for memory and learning which gets a workout during the 6 or so hours a day I spend researching and writing essays to post on this blog. At the risk of offending my Tea Party friends who still can’t seem to come to grips with the fact that health insurance is not only for their benefit but to prevent uninsured costs from being shifted on to other people, I recommend a report published last month entitled The $11 Trillion Reward. That is how much would be saved each year if Americans just increased their consumption of fruits and vegetables and yes, it would ultimately lower the deficit. No, I don’t just mean those living in Red States which tend toward higher rates of obesity. I was only saved from the genetic tendency toward being overweight by the fact that doctors discovered in my early 20s that I can’t metabolize sugar very well, including refined carbohydrates. If they didn’t make me sick, I’d still be binging on my mom’s homemade cinnamon rolls and a big bag of glazed Spudnuts. But all my life I’ve eaten way too much red meat, not just because I grew up on a cattle ranch, but because a high-protein diet suits me. But recently I began to substitute poultry or fish four or more times a week. I know, not very Idahoan. The report is not only about quantifying savings if Americans increased our individual fruit and vegetable daily intake on average by 1/12 cups of fruit and a mere cup of vegetable, although just that change would save 127,261 lives a year and public savings of $54 billion a year in medical costs. Recalibrating programs to increase R & D and production of fruits and vegetables by shifting incentives to help diversify growers and gearing them to local markets. Grants to spur greater availability of farmers markets and grocery stores in low-income neighborhoods including moving “helping hand” food programs to more healthy choices. This is simply about protecting innocent Americans from the hidden costs related to the actions of others. I agree, and I suppose that means that anyone should be free to binge on whatever foods they wish, and businesses should be free to cater to those binges with junk. But other Americans should not have to shoulder the costs of healthcare consequences of these binges or their binge enablers nor should my tax dollars be used to subsidize either the binging or the creating of the foods that are binged upon. Shifting costs onto innocent Americans because you are too stubborn to have health insurance or to eat what is good for you, is a huge tax loophole.